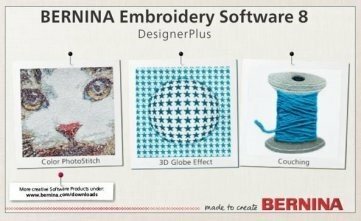 Bernina Software 8 has many advanced features for creating designs. Join Dawn as we continue to learn this powerful software. Bernina Embroidery Software 8 Owner’s Workbooks 1 through 4. Please contact instructor if you need a copy of the workbooks. *Note: an external mouse is critical as the touch pad built into laptops do not allow you to utilize all the commands all the software. Beginning and new software owners. You can register for any class in the store. If you are paying by credit card, you can register online, or phone (760-739-8222 or 858-225-2739). The registration fee for the class must be received to reserve your space. Most classes have a minimum number of students to run. If we do not meet the minimum number of students for the class three (3) days prior to the class, we will notify you that the class is cancelled. If your class is not held for any reason, you may transfer to another class or receive a refund. You may cancel for a full refund up to four days prior to the class. No refunds can be given within three days prior to a class. Class fee is waived if software was purchased from one of Sewing Machines Plus retail locations.